Happy New Year! 2018 has already begun some places on Earth. In Yakutsk, it's a quarter to eight in the morning on January 1st and a balmy minus 27F (minus 32C). (It's Siberia, that's balmy). But here in Montana, we're squeezing in the last of the year's activities. Chaos and I ran this morning and XC skied early this afternoon, racking up a few last miles for the year, and now I'm having a double espresso, my last caffeine of the year. It's been a remarkably good year, I think, for me but also for the world. No particular commentary needed here, just note that 2017 was actually a year of strong economic growth -- that is, of people building and creating and serving each other and bettering themselves -- for most of the world. That's the big picture. May 2018 be the same, for us, for our readers (if any) and everyone. Photo: Chaos "dashing through the snow" on last ski trip of the year. P1: The “Russian collusion” witch hunt will fall apart, replaced by scandals over the Obama-DNC-deep state-Hilliary conspiracies. Not only were there conspiracies against Donald Trump, Bernie Sanders and all other challengers, there were conspiracies by Hilliary Clinton to maximize power and wealth for the Clinton Foundation, conspiracies to protect her, various Middle Eastern skullduggeries to ensure passage of the terrible Iranian nuclear sellout, conspiracies by the IRS against conservative political groups, the “Fast and Furious” conspiracy, illegal interference with the campaign in Israel in the runup to Netanyahu’s re-election, etc. ad nauseum. The political class, including Republicans, would prefer to ignore all this abuse of power, since paying attention is likely to result in the curtailment of power, but we predict they’ll fail. P2: The DNC “Russian hacking” will prove to have been an inside job, perpetrated by the Awan family. Debbie Wasserman Schultz’ IT experts, Imran Awan and the Awan family business, stole emails, reports, data, everything from House Democratic Caucus members. Their criminal activity included much else; we think this helps explain why the DNC refused to give the FBI access to their hacked servers. Of course, DNC collusion with Fusion GPS and Christopher Steele is another reason. I’m sure there’s plenty more dirt as well. But we predict the Awans will be implicated in the leaks. P3: U.S. economy continues to grow at rates faster than during Obama years. Predicting the economy is always dangerous, because of the vulnerability to things such as interest rate swings, which are potentially volatile. But we predict stability in interest rates. Hence we predict that, comparing December 2018 with December 2017, (i) the unemployment rate will be lower, (ii) the labor force participation rate will be higher (this makes prediction (i) harder to achieve…and actually meaningful), and (iii) at least one month in 2018 will have a higher rate of growth than any month in 2017. That’s three objective criteria, to make up for the lack of such in P1 and P2. P4: Republican Party retains control of both houses of Congress. One might wonder why I don’t class this as a “High Risk” prediction, or even why we predict it. On the surface, those doubts seem warranted, particularly because the GOP Congressional leadership behaves like an opposition party, and seems to strongly prefer being in a minority – as a minority, they get to complain and act like know-it-alls, yet never have to make tough decisions or bear responsibility. However, there is one thing working against them – the Democrats. Today the Democrat Party seems to be little more than the party of New Left identity politics, that is, of victimhood, demands for handouts, socialism, and hatred of anyone – including moderate Democrats -- voicing a differing opinion. This is not a winning platform, and it also renders proponents incompetent. For example, for most months of 2017, the RNC has beaten the DNC 2 to 1 in fundraising. Dem leaders are at each others’ throats over Donna Brazile’s revelations, Hilliary’s continued inane excuses, and, as in P1, P2, and P3, the bad news for them will continue. They’ll lose. P5: Record new firearm sales for United States in 2018. If I'm not mistaken, 2017 was second highest year for sales, demonstrating the degree to which the Democrat Party is in tune with a large number of Americans... which is to say, not at all, since Dems regard us citizens who are merely exercising our rights both as enemies and as problems to be solved. We expect the trend to accelerate in 2018, as Dems and the left spin further into craziness... which only increases demand for tools of liberty and self-defense. P7: No war with North Korea. This one really seems high risk to me, but the Unforeseen Contingencies forecasting team and the Unforeseen Contingencies Korea Desk both assure me it’s the way to bet. P.R. China is not an honest player in curbing DPRK, but the Chinese will still apply pressure to Pyongyang to keep it from going too far. And the absence of appeasement from President Trump’s foreign policy toolkit is at least as important. That’s seven predictions, plus the wild card (rather upbeat predictions at that). Perhaps before the end of the year we’ll round this out to an even ten with three more, and perhaps not. But regardless, Happy New Year to all our readers (UC Subscription Department asks “we have readers?”) and may 2018 be a very good year for liberty, prosperity, and happiness! Merry Christmas, from all of the staff of Unforeseen Contingencies! Gregorian calendar, of course, we'll have another post for Orthodox Christmas. Julie, Chaos, and I are making our annual December pilgrimage across the Great American Desert, and have arrived safely in Glendive, Montana. Tomorrow we will proceed to my mother's place in Great Falls. The trip has been normal, little to report so far... light snow in UP, even lighter snow in eastern Wisconsin, cold weather in Minnesota (with locals commenting on the unusual warmth), high winds and ground blizzards in North Dakota (with everyone, including me, noting that these were very good driving conditions for North Dakota). But there was one thing slightly unusual that I noticed. In every single store, restaurant, and motel we've stopped, people have wished us a "Merry Christmas." By my count, this is increasing in popularity. I think that's important. I think it's a sign that political correctness is not sinking in. Yeah, yeah, this is a small and maybe not-random sample, and I suppose one could say it's so minor as to be meaningless. I disagree. First, it's the only sample I have, so lectures on what the sample should have been are irrelevant, let's learn what we can from it. Second, no, it's not unimportant. The primary way of controlling people is to get them to do it themselves, primarily through intimidation and guilt. Cracking down on traditional values and beliefs is away to do this. Well, it's not working. There was a time when people seemed a bit afraid to say "Merry Christmas," especially in a commercial setting. But at least in places I've been that doesn't seem to be true now. Sure, we weren't in the Upper East Side of Manhattan, or Madison, Wisconsin,or Ann Arbor, MI. But in saner parts of the country, sanity may well be advancing. What shall we do with returning ISIS jihadis? The Canadian government also notes it would be difficult to prosecute them. Of course. That's why declaring them enemy combatants, rather than criminals, is important. It would also be accurate. German intelligence already said (last year) they have identified 500 Daesh who've entered Germany, and also believe there's a command structure. That's an enemy battalion. (But they don't know where they are - they came in as refugees, and vanished.) Criminal prosecutions aren't necessary. A military tribunal should only have to establish that the accused are indeed Daesh (or Al Qaeda or similar enemies). Once one is identified as an enemy, that's enough. In WWII, any country that had an enemy battalion slip in would have hunted them down and killed them. And under laws of warfare, including Geneva Convention, summary execution would have been legal since they aren't in uniform. Reintegrate Daesh? Guaranteed terrorism ahead. The story "10,000 are going to return and no one is sure what to do" defines insanity. Don't let them return; killing them, where they are now, is called for, if possible. And if they make it back, military tribunals and life imprisonment or execution for anyone who was in ISIS. That won't happen in Europe, of course. Maybe we Americans will prove more sensible. I can imagine how today's politically correct progressives would have fought W.W.II: storming Normandy Beach, Tarawa, Kursk, Bagration, etc., racing up to enemy soldiers and reading Miranda rights, or offering counseling and welfare benefits. Or just surrendering. "10,000 jihadis are coming back, what should we do?" This is a problem where there's only a military solution. Photo: Daesh "fighters." 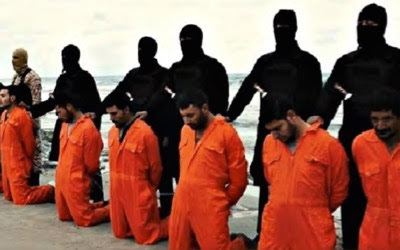 I nominate Angela Merkel, Pierre Trudeau, Stefan Löfven, and Theresa May to rehabilitate and reintegrate these guys, if they think this such a good idea. "Don't be evil." Anyone who takes that as a motto is almost certainly evil. If you have to remind yourself to not be evil, it's too late. Here's an example of Google's malice, courtesy of Daily Caller. The heads of Google censor expression that doesn't fit with their political biases, while pretending to foster freedom of thought and speech. Hey, Google... don't be evil! This past Saturday evening Julie, Chaos, and I completed our last race of 2017, Running Fit's "Holiday Hustle 5K" in Dexter MI. It's a very fun race starting on the edge of downtown and running through nice residential neighborhoods, and Running Fit always puts on a beautifully organized and enjoyable event. We did not run fast, but we ran, and the three of us crossed the finish line together. It's the first race I've run since surgery, and felt great. Now, on to 2018! Concerning Trump's announcement that the U.S. Embassy to Israel will be relocated to Jerusalem, a friend of mine writes me that "Time will tell whether this was a wise move, or not." Indeed. I think this will prove to have been a wise move. In addition to what I've said in my previous post, there are two additional points I think important. 1) The Palestinians must recognize that intransigence does not pay off. They must accept that Israel is permanent. They must give up fictions like "occupation" and "return to pre-67 borders," and flights of fancy such as "right of return." 2) It's great that the United States is now taking a strong position with respect to the Palestinian Authority, instead of a weak, politically correct position. Trump is badgering the PA -- threatening their office in NYC, threatening their American funding, and now accepting Jerusalem as Israel's capital. Every time a proposed Middle East peace deal has collapsed, it was the PA who sabotaged it. President Trump's pressure on the Palestinians is welcome. Playing hardball with these hoodlums -- long overdue. That's the only way progress can result. 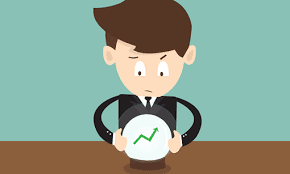 Later this year, "we" at Unforeseen Contingencies will again make predictions for the coming year. Our prediction for Israel and the Palestinians will among them. 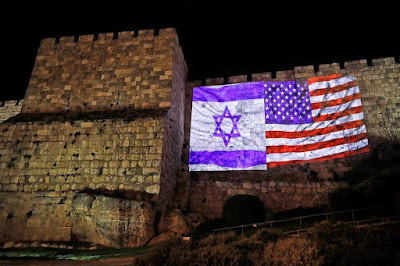 Photo: U.S. and Israeli flags projected on walls of Jerusalem, city founded by the Hebrews. On this day in 1941, the IJN attacked American bases at Pearl Harbor and elsewhere, as part of the imperialist expansion of Japan's totalitarian regime. In doing so, they, along with the Germans and Italians, helped end what had been a trend towards the civilizing of warfare, when at least governments would declare war before waging it. And on this day in 1683, the great political theorist Algernon Sidney was executed for having written Discourses on Government, one of the greatest libertarian works, which held that governments only exist to protect individual rights, and that individuals have the right to abolish them if they fail to do so. It was the single most important work influencing the American Revolution. It's a good day to remember Sidney's maxim: "This hand, enemy to tyrants, by the sword seeks peace with liberty." 1. President Trump's reduction of the scale of monument designations is a good thing. Monument designation doesn't protect natural land that was otherwise being destroyed, it simply blocks most uses of it, and is an Presidential power of doubtful Constitutional authority, at least when it's used to effectively control use of adjacent lands and promote ulterior personal and political agendas. 2. Recognizing Jerusalem as capital of Israel is a great idea, and long overdue. The U.S. Congress already passed a law in 1995 calling for this, with numbers sufficent to override a veto. No President implemented it until now, claiming an executive prerogative over foreign policy. Trump is both exercising that prerogative and implementing the law. Jerusalem was founded by the Hebrews 1600 years before Islam even existed. It already is the seat of government for Israel. Maps drawn by Palestinian Authority maps typically omit Tel Aviv, the alternative to Jerusalem, so what do these fools expect? And Muslim Arabs frequently omit Israel itself, as do other idiots. BBC ran a headline claiming that "The World condemns Trump" over this, which is nonsense. Yes, a number of world leaders who are anti-American and anti-Israeli may be upset, but they aren't the world, plenty of us are pleased with the President's move. Yes, many Muslims are mad, but this is because they're going to have to resign themselves to the fact that Israel is a permanent Middle East fixture, and the U.S. is no longer intimidated by their whining. Exterminationist fantasies die hard, but die out they will. 3. In response to the Jerusalem announcement, Muslims in Gaza tried to kill Israeli civilians by firing rockets into Israel. They failed. Wow! An illogical, stupid, evil, and failed response...that sums up so much of official Palestinian policy towards Israel. Is leftist thought a form of mental illness? It appears to be. On his "I Want a New Left" blog, philosophy professor John Pepple makes three points that strongly suggest today's leftists are simply insane. First, quoting an anonymous blog commenter, he observes that much of the "narrative" the left promulgates today -- incessant claims of microaggressions and victimhood and outrage -- follows exactly the procedure of cognitive behavioral therapy (one of the few psychological treatments that actually seems to be effective). Only instead of promoting the positive and the solving of problems, it promotes hostility, hatred, and failure. It's cognitive behavioral anti-therapy in service of dysfunction. Second, in discussing Elizabeth Warren's refusal to get a DNA test to prove her claim she's an Indian, Professor Pepple observes that Dems really seem to not even understand the positions of their political opponents, and gives several examples. I think this is proof that modern leftism, at least this common sort, is intellectually and morally empty, and also a mere dogma or faith, a set of beliefs held without reason, and often in defiance of reason. Pepple's post is particularly worth reading. Finally, in a second post on Pocahontas Warren's "Indianness," Pepple notes that she appears to claim to be 1/32 Cherokee. That makes one an Indian? Well, of course. In modern leftist thought, men can be women, women can be men, men and women can be one (or more) of 61 or so otherkins, or anything else he or she or it or [place pronoun of choice here] wants... but only if he or she etc. holds the right set of beliefs about Trump, free markets, gun control, Islam, and so on ad infinitum. Otherwise, "he" is a white male oppressor -- like Ted Cruz, Clarence Thomas, Nikki Haley, Condoleeza Rice, Bobby Jindal, Thomas Sowell, Walter Williams, Carly Fiorina, and the rest of those old white males. Yes, leftist thought is clearly a form of mental illness. It's less clear it actually qualifies as thought. Last december I posted four resolutions for 2017. It's safe to say I will complete none of them this year. I owe this, first of all, to the falling-apart of my hip and August surgery, which precluded three of the four goals. The fourth, completing my pipeline economics project, well, I failed that from a combination of unexpected work duties and plain laziness. BUT there was another resolution I made, one which I did not share. And today, I successfully completed it. It was tough, a real challenge, a test of my strength and character. There was much to overcome, but through dedication and perseverance I succeeded in achieving my goal.